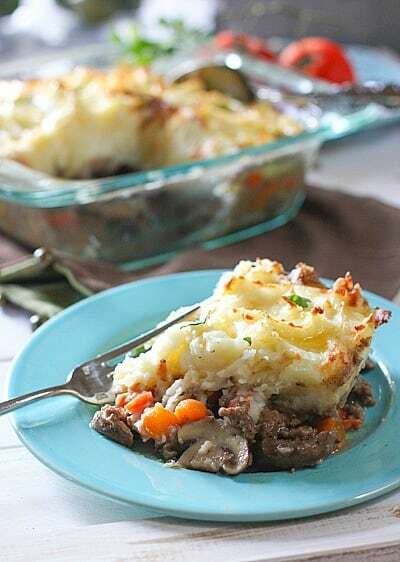 Hearty Beef and Mushroom Shepherds Pie! – A favorite around here ! I really racked my brain trying to figure out what to call this dish besides just ‘Shepherds Pie’. ‘Fabulous’, ‘Ultimate’ and ‘The Best’ were all contenders. But when I think of this dish…I think ‘Hearty’ all the way. 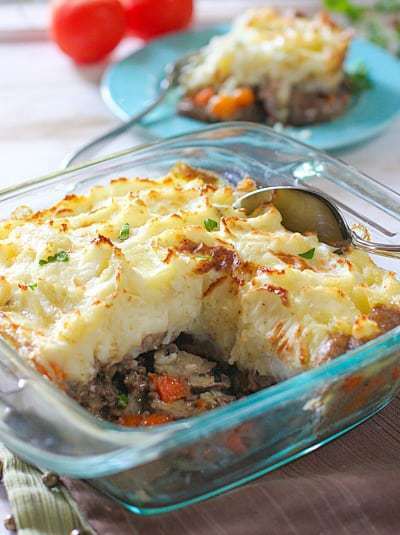 In my world of lightened up food, this Hearty Shepherds Pie is a rich and wonderfully comforting meal that still remains relatively healthy with whole ingredients! Yes, there is some butta in them taters but I didn’t add the whole cube and the mushroomy gravy is simply beef stock, thickened with a bit of flour, cooked right in the skillet with the beef so it gets a super rich flavor. The mushrooms really kick up the beefy flavor as well. I have a fairly limited amount of beef recipes on this blog, ground or otherwise. I love beef, I just don’t always cook it well. I leave that to the steak houses. Ground beef can be a bit, well, ‘economical’ tasting for me :). But in this dish it is perfect. I suppose you could sub ground turkey or chicken and it was tempting for me. But sometimes…a girl just needs a little beef and tater casserole. Have to say, Mr. LS sure did appreciate it too. It’s a mans meal and there was a big old happy food grin looking over at me! Start large pot of water to boil for potatoes. Peel potatoes and carrots. Cut up potatoes. Chop onion, garlic and carrots. Heat large skillet for beef mixture. Add potatoes to boiling water. Start browning your beef while potatoes boil. Add veggies to beef, flour and stock. 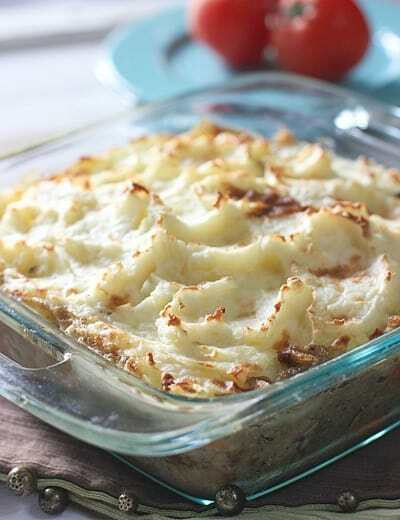 Drain potatoes – put back into large pot where you will mash with sour cream, butter and milk. Assemble casserole – bake and done! Not so daunting at all! Clean up while casserole is cooking and you are done! You can even make this early in the day and eat all weekend long as it reheats really well. Add ins – There are a lot of things you can do here. Corn, peas and cheese are the first three things that come to mind but if you have broccoli or celery, those all work. This dish is a fridge clean out receptacle. Almost anything goes! You will notice the addition of nutmeg. If you have not tried nutmeg in savory foods you are in for a treat! You can leave it out but it adds a wonderful nutty flavor. A thicker mashed potato consistency is recommended for this dish. Adjust the addition of milk accordingly. For a larger crowd or if you want to feed your family for a few more days. Simply double the recipe and use a 9 x 13 baking dish. Another of my favorite hearty casseroles is Baked Spaghetti Casserole! Too beefy, hearty, make your hubs happy meals! This delicious and comforting meal is healthier than you would think! Bring a large pot of water to boil for potatoes. In large skillet, brown beef and drain off excess fat. Add carrots, onion, garlic and mushrooms to beef. Saute for 5 minutes until veggies are tender. Sprinkle beef mixture with flour and cook until flour is no longer visible. 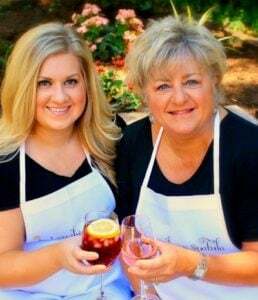 Continue to cook until thick and bubbly. Turn off heat and mash potatoes. Drain potatoes and place back into large pot. Add butter, sour cream, milk, salt and pepper. Whip with electric mixer or use a hand masher (I use a hand masher). Add more milk is thinner consistency is desired. A thicker mashed potato is recommended for this dish. Pour beef mixture into baking dish. Top with mashed potatoes. Bake for 30 minutes or until top is brown and sides of casserole are bubbly. Made this pretty close to recipe . Added kambucha squash to the potatoes and left everything in the skillet to bake rather than transferring to another dish. Also didn’t have beef stock so just used water. Came out pretty good. Will make again. 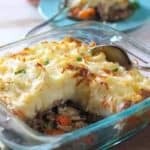 I love shepherds pie, but have never even thought of adding mushrooms? Brilliant!! I’m adding mushrooms to everything lately…its a phase 🙂 Thanks for your note! We are in the middle of a snow storm right now, and all i can think of is warm comfort food for dinner… and this looks like it will definitely fit the bill! Delicious! Well this would fill you up and you could shovel snow for hours! 🙂 Thanks for your note! Thanks Fareeha, hoping you get a chance to try it! Hmm…how can you give it 5 stars if you haven’t tried it? I want to hear someone who has tried it. I agree it looks delicious, and I will try it, but then I will review and give it the stars my taste buds think it deserves. This is such a delicious dinner idea. 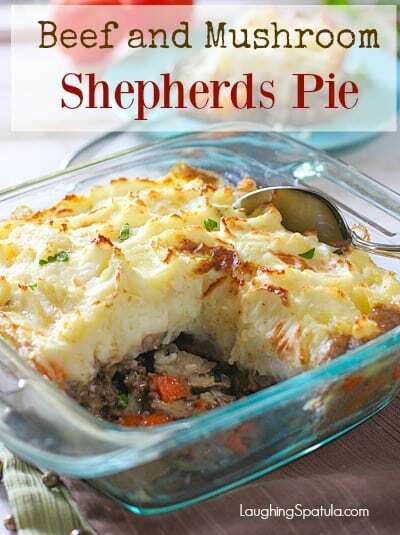 I’ve never had Shepherds pie yet, so I want to try it. Pinning! Hi Shelly! Thank you for the nice note! So happy you loved it!